I hope your holidays were more joyous than stressful. I love the holidays, but its nice to get back home and back into a routine. Making time for tarot reading during such a hectic time was more difficult than I expected, but I did have an opportunity to do a lot of tarot book reading. 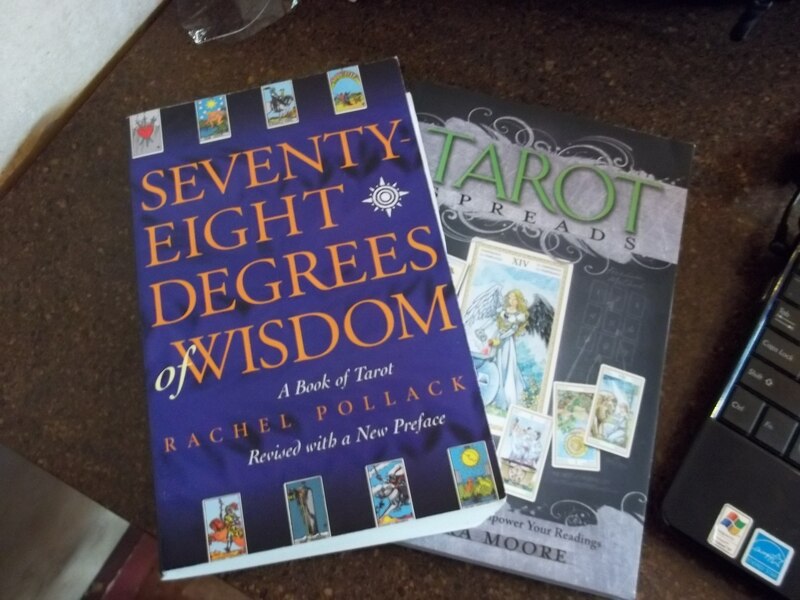 I received an Amazon Gift Card as a present and I promptly purchased a copy of Rachel Pollacks 78 Degrees of Wisdom and Barbara Moore’s Tarot Spreads. I would highly recommend both. 78 Degrees is a great, thorough look at the whole Rider-Waite-Smith deck and all its symbolism. Additionally it goes over some tarot history and reading basics. A perfect place to start for a beginner, I wish I had picked up this book first when I started reading. Its also an amazing reference tool for more seasoned tarot professionals. Barbara Moore’s book on spreads is full of…well…spreads, but beyond that it teaches you how to modify and design your own spreads and I love her writing style, very accessible. This book doesn’t go much into the basics of how to read or what all the cards mean, but that’s not its purpose, so it will be best suited for someone who already has a fundamental knowledge of how to read, or a beginner who will use it as a supplement to their primary tarot text, like 78 Degrees of Wisdom or Learning Tarot by Joan Bunning.